Foods for a Naturally Beautiful and Glowing Skin. It’s a beautiful Saturday Konnect Africans!!!!!! And it is our prayer that you prosper and be in good health; always glowing and growing from strength to strength. But you know what? You definitely need to eat right to feel right and look right. Everyone desires a beautiful skin, buying the latest and the greatest skincare products such as IT Cosmetics new foundation. But the truth is, a beautiful skin starts with nourishment from within. Older cells are constantly shed and replaced by younger ones and a steady supply of micro-nutrients is essential to support this rapid growth. Eat the correct balance of foods and you’ll feed your skin the vital nutrients it needs to help it stay soft, supple and blemish-free. The choices we make matter; even in eating, they go a long way. As with most health benefits, it comes down to our everyday life, rather than how much you can afford to spend on products. The things you can do to beautify your skin are remarkably similar to what you can do to strengthen your heart, control your weight, and lift your mood. In this article, we will give you 6 foods that can make you more beautiful and healthy from within. 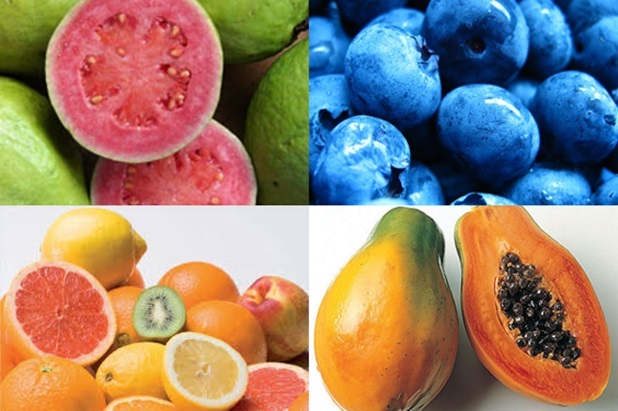 Vitamin C rich foods– Vitamin-C is a super antioxidant. It is needed for a strong immune system, radiant skin and helps blemishes heal properly. Research suggests that vitamin C may help protect skin cells against sun damage by promoting the repair of DNA that’s been harmed by UV rays. UV rays break the chemical bonds of the skin cells, killing them and damaging their DNA, which may eventually cause cancerous growth. It is true that vitamin C can be found in various cosmetic products, some of which have been shown to be effective in protecting the skin- but isn’t it better to go straight to the source? Please never end the day without some Vitamin C in your system. This vitamin aids in the body’s production of collagen, a protein that forms the basic structure of your skin and strengthens the capillaries that supply the skin. Collagen breakdown, which starts speeding up significantly around the age of 35, can leave your skin saggy [source: RealAge]. Consuming extra vitamin C can help tighten the skin and prevent wrinkles. 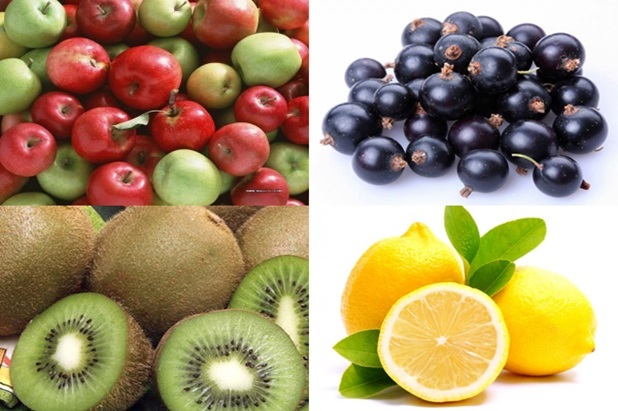 The best sources are: Oranges, black currants, blueberries, broccoli, guava, kiwi fruit, grape fruits, papaya, strawberries, lemon and apples. Strawberries can also be used to whiten the teeth. They contain malic acid, a natural whitening agent. Tomatoes- are very good for the skin. 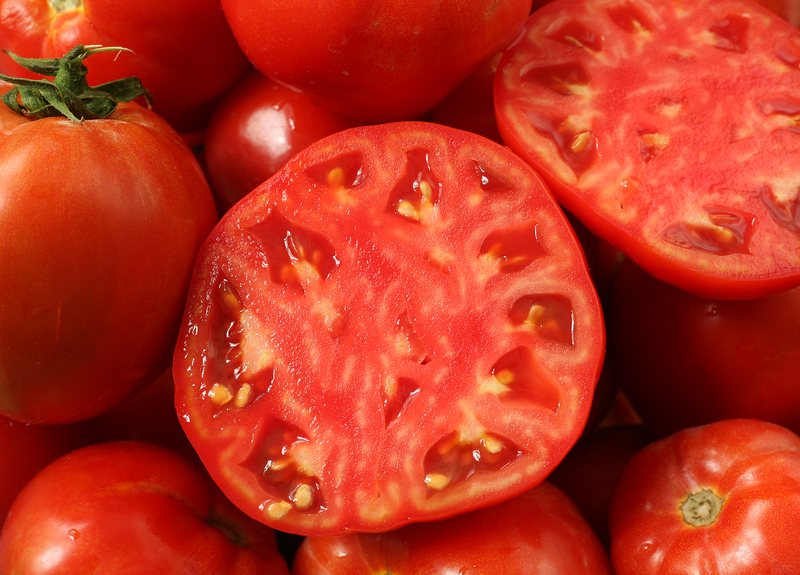 Consuming more lycopene- the carotenoid that makes tomatoes red-may protect your skin from sunburn. Nuts- these are a major source of vitamin E. Vitamin E combats skin-aging free radicals, especially protecting skin from sun damage due to UV-sunlight-generated free radicals. Vitamin E also tends to help skin hold in moisture, relieving dryness and making skin look younger. 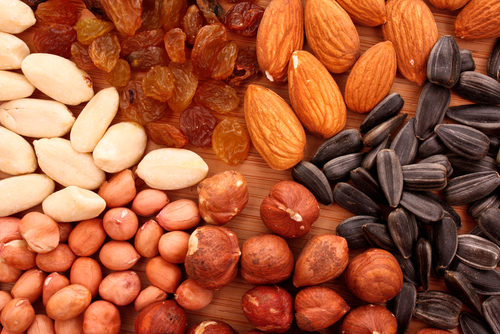 Foods high in vitamin E include;almonds, avocado, hazelnuts, pine nuts and sunflower and corn oils. Red-orange and green vegetables- Orange-red vegetables are full of beta-carotene. Our bodies convert beta-carotene into vitamin A, which acts as an antioxidant, preventing cell damage and premature ageing. 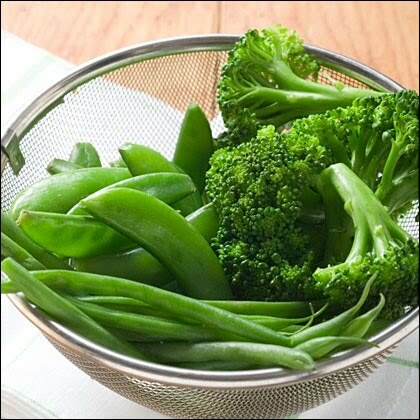 Green vegetables provide tons of vitamin A, too, which helps the skin produce more fresh new cells and get rid of the old ones, reducing dryness and keeping the face looking bright and young. 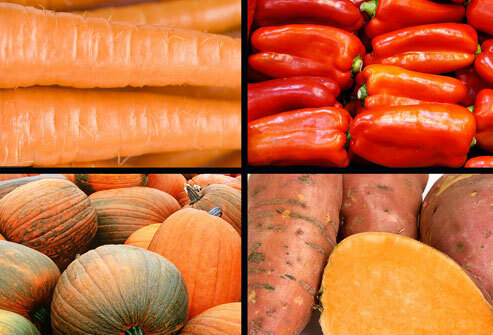 Foods rich in vitamin A are: carrots, sweet potatoes, spinach and other green vegetables. 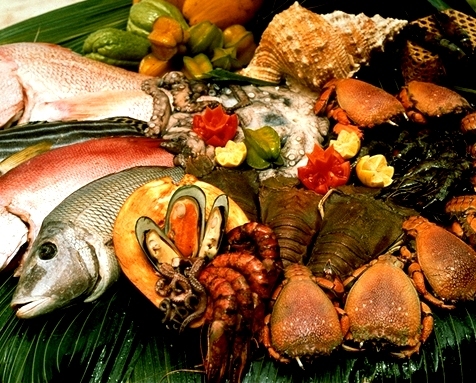 Sea foods- Fish can be really good for your overall health, many types of fish and shellfish can also work wonders for the skin, especially oysters and fatty fish like salmon. Sardines are also very healthy. The primary nutrients that make fish so good for your complexion are zinc and omega-3 fatty acids. Increasing omega-3 intake can reduce dryness and inflammation. Inflammation can cause skin to age faster, and research shows that getting too little omega-3 may contribute to inflammatory disorders like eczema and psoriasis. Omega-3 fatty acids can also help keep the heart’s arteries clear and so improve circulation. Good circulation is crucial to skin health. Be sure to get enough omega-3 and omega-6 fats. As they are essential fatty acids which mean they cannot be made in the body and must be obtained through the diet. You will find omega-3s in oily fish and plant sources such as flaxseed oil, linseeds, walnut and rapeseed oil. Zinc can help fight acne because it’s involved in metabolizing testosterone, which affects the production of an oily substance caused sebum, a primary cause of acne. Zinc also assists in new-cell production and the sloughing off of dead skin, which gives the skin a nice glow. Water- you must have heard that water takes up about ¾ of your entire body mass. Skin needs moisture to stay flexible. Even mild dehydration will cause your skin to look dry and tired. Whatever you do, try to drink six to eight glasses of water every day. It is true that all fluids count towards your daily allowance, but water is the best. If you work in an office, keep a large bottle of water on your desk to remind you to drink. Herbal, caffeine-free teas are good too. Eat healthy, look beautiful. Best wishes from Konnect Africa. A Pan-African inspirational magazine that promotes innovation and development in Africa by sharing Africa's success stories and showcasing African talents in Governance, Entrepreneurship, Business, Technology, Energy, Fashion, Sports, Education, Arts and Culture. Follow us as we inspire Africans everywhere. More Foods for a Younger Looking Skin. Hi, thanks a lot for sharing good information. I am glad to found your post; I would to add these nutritious foods in my routine. Yes Tery Dawson, that will be great. Health is wealth. DermalMD Serum is absouloutley amazing! It’s not greasy or oily which is a big plus for me and my skin. The actual product is not thick or runny so a little bit goes along way. It applies really smooth with no after feeling. It has vitamins c,d,e and a so u don’t need 4 different bottles this is an all in one deal.it makes my skin feel very smooth and almost glowing. If u ask me I look 10 years younger just in the few weeks I have been using. You will not be disappointed in the product. I will reccomened this to all my friends and family. This Powerful eBook is Our Gift To You. A Short, Life-Changing Book You Can Read in One Sitting. Your eBook is on its way to your email. Let's see who will get there first. Our mission is to inspire and empower Africans everywhere by sharing the life-changing stories of Africa's Super Achievers and Africa's Thought Leaders. Want to Submit An Article/Success Story?